WHAT: The University of Missouri School of Law will host the 2013 Missouri Law Review Symposium, “Bombshell or Baby Steps?” The symposium will focus on a recent United States Supreme Court decision, Miller v. Alabama, which held that mandatory sentences of life without parole for juveniles are prohibited by the Eighth Amendment. The symposium will address constitutional, practical and policy matters regarding juveniles and sentencing. Panelists will discuss the impact that the Supreme Court’s decision on Miller v. Alabama has had on state legislatures and Congress. The Missouri Law Review is an entirely student-run publication and one of the oldest legal publications west of the Mississippi River. NOTES: The symposium is free and open to the public. 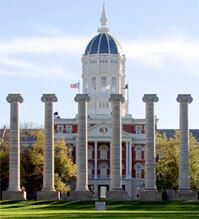 For a full schedule of events and to register for the symposium visit http://law.missouri.edu/faculty/symposium/lawreview2013/index.html.